Built in the early part of the 20th century, the former P.S. 64 has seen wave upon wave of new New Yorkers. 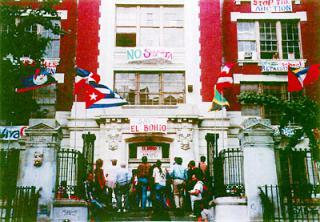 Beginning in 1977, led by a pair of community-based organizations, Adopt-A-Building and CHARAS, the building was transformed into a community center known as El Bohio. The grass-roots initiative mirrored a local and nationwide citizen-led rebirth of urban centers and helped to catalyze the revitalization of the surrounding “Loisaida.” P.S. 64/El Bohio was not the only building that New Yorkers saved from destruction in the 1970s and returned to productive use. Its special significance is in its identity as a public building, dedicated to the revival of community and of cultural survival. As such, P.S. 64/El Bohio long has been recognized by many as one of the principal places to embody these historical events.